Breakfast being the first meal of the day is very important to me. My husband does not believe in breakfast and its health benefits, but I like to sneak and pack a small bowl of granola, a muffin, a banana or some dry cereal for him to munch in the morning. But for me skipping breakfast does not do anything good rather than makes me eat more during lunch which negates the whole purpose of fasting or dieting. The word BREAKFAST truly refers to the breaking of fasting period of the previous night. So something easy, light and healthy for the tummy is my preference on weekdays. Make ahead breakfast or easy to go breakfast options are a great way to hurdle the busy weekday mornings. Granola bars, breakfast muffins, Oatmeal or a healthy parfait works perfectly on weekdays. I was really contented to add another breakfast option to my repertoire. As I was cleaning up my pantry I came across a bag of quinoa that was sitting in my pantry for some time. It ended up in the form of crunchy granola with a mix of nuts and some coconut flakes. I love to fill up the mason jars in the pantry with healthy treats like this and hide the store bought snacks behind it, so when my kids come from school and go hunting in the pantry they will see the homemade snacks in the front of pantry in clear mason jars and would pick them up instead of the store bought snacks. 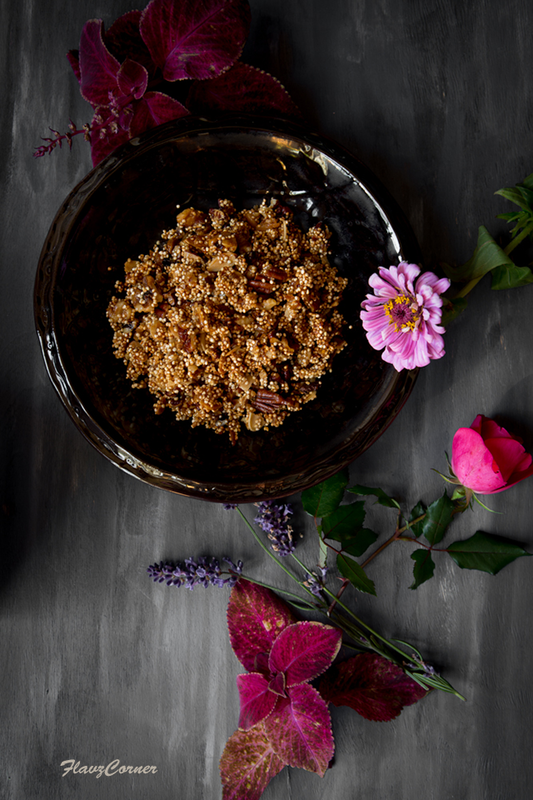 But with this delicious granola, I didn't have to try anything tricky. Half of the granola was already gone by the time I decided to take pictures. 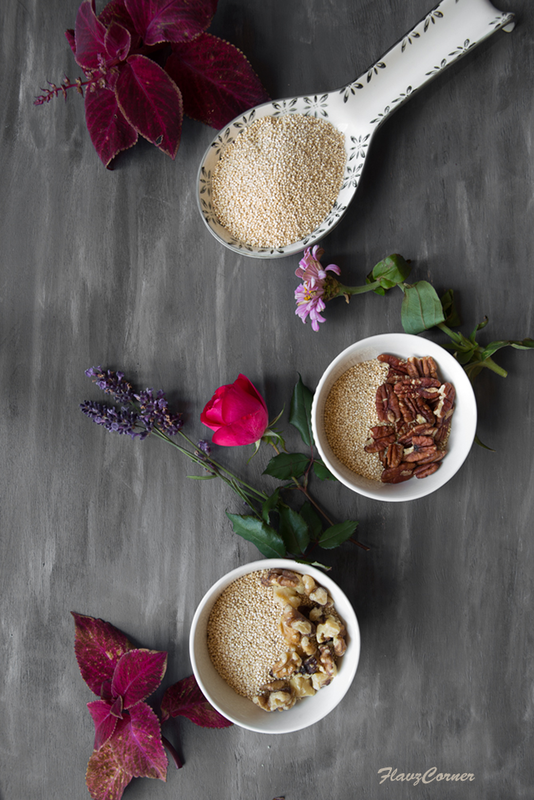 The nutty roasted aroma of quinoa and nuts would tempt even the picky eater in your house. 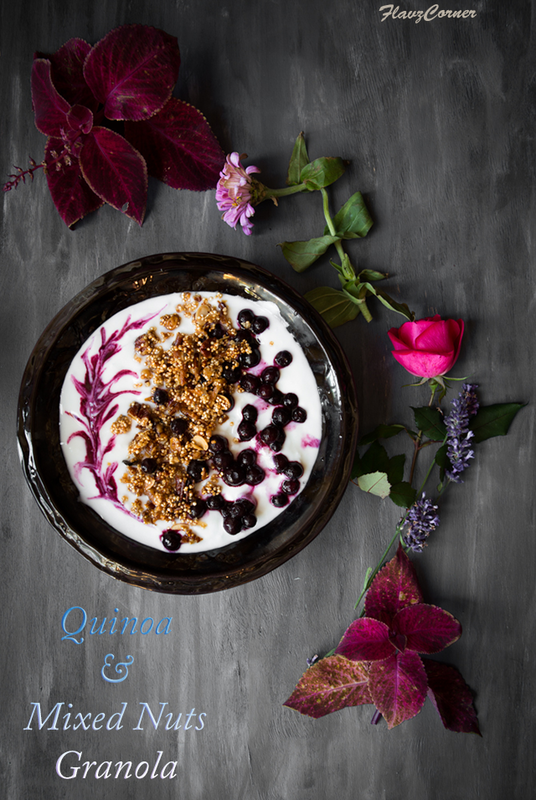 This granola serves as a perfect breakfast, a quick dessert fix or an after school/work snack with a bowl of plain yogurt, some fresh/frozen fruits and a drizzle of pure maple syrup or honey. Rinse the quinoa thoroughly. Use a fine mesh sieve to rinse it few times and set it aside to drain water completely. Spread the quinoa on a baking sheet and bake till it attains a golden color. Set the timer to 5 minutes and take it outside and give a stir and continue baking till its light golden color. It takes from 7 - 10 minutes to completely dry the quinoa. Whisk together the maple syrup, oil, vanilla and salt in a mixing bowl. Add the nuts, coconut and quinoa to the bowl and mix well. Line the same baking sheet with parchment paper and spread the quinoa mix on it and bake for 25 - 30 minutes till the nutty and toasty aroma comes out and the granola is light golden brown. Take it out from the oven and stir well and let it cool completely before you transfer it to a clean dry jar. Make sure you rinse the Quinoa well, otherwise the saponins on the seeds might give a bitter taste. Don't over cook granola over 30 minutes, it will burn. The granola will be still wet after the cooking time, but they will dry up once it cools down. The cooling process will make the granola crunchy. I am a morning person, so breakfast is very important to me too. 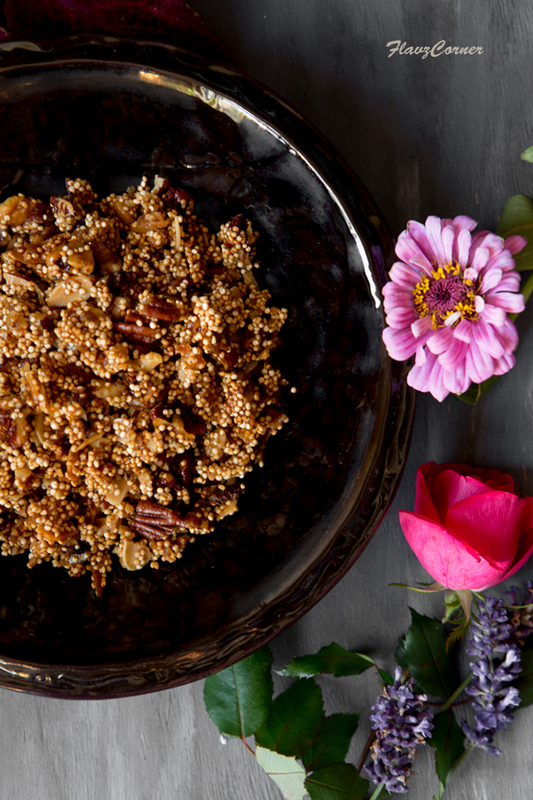 Your quinoa granola looks so crunchy and divine. Beautiful styling, Shibi. I've gone back and forth on breakfast. Most days I just have some fruit and a hard-boiled egg. But if I'm eating later --brunch, really -- they I want something heartier. This looks delish -- and a fun way to use quinoa! Thanks.